a saturday smile: Farmhouse kitchens. Nothing inspires you to make or cook really unhealthy things than a nicely stocked, beautiful farmhouse kitchen. There is something about being out in the country that really gets your Betty Crocker/Martha Stewart/Julia Child part of the brain really turning. 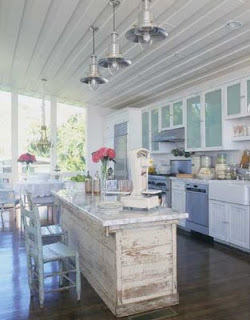 I love these gorgeous kitchens and seem as though they'd make cooking that much more fun. 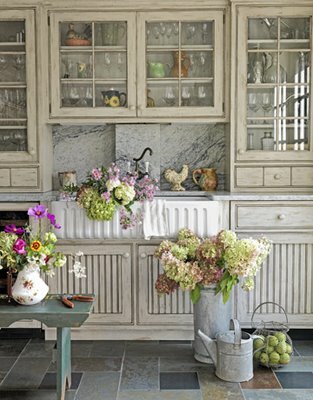 First off, for true farmhouse kitchen style, you need one of these fabulous white enamel double-size sinks. New sinks can run pretty high. But always try secondhand and rural stores before purchasing a brand new reproduction. But when buying used, always check the rust deposits around the drains, the quality of enamel on the front of the sink, as well as the size. Also remember total in the cost of a new faucet. 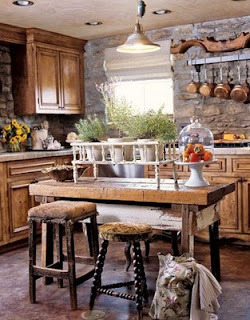 All farmhouse kitchens, or all kitchens for that matter, ought to have islands. But when you have a farmhouse or country home, it's always fun to purchase independent pieces of furniture to use as islands. 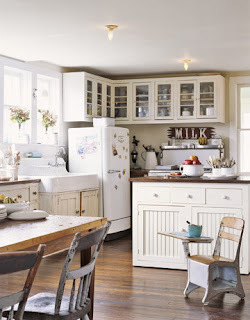 For instance, you could use old workbenches, cabinets, desks, dining tables, etc... You want your island and work space to feel like it is its own handpicked piece of furniture. No matchy matchy cabinets, islands, countertops here. Every kitchen that I've considered "my dream kitchen" has retro appliances. Again they make reproduction refrigerators and stoves that function like modern appliances but look old. In this case, I would suggest splurging on reproduction appliances. That way, you don't have to worry about malfunctions. Sink and tubs can always be secondhand. 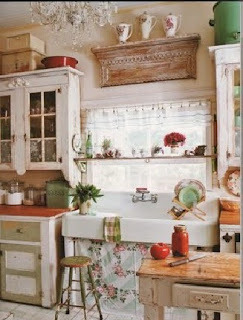 If you have a lot of collectibles, like I do, it's a great idea to use glass cabinets in your kitchen. It's a great way to display all those odds and ends you've been collecting for years. 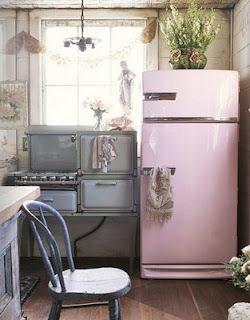 LOVE this pink refrigerator. Not sure my husband would though. In more rustic homes, it's very effective to integrate unrefined elements into the space, like the rock walls, natural wood tones, and cowhide stools. Things like this help to keep the room more masculine.